Official blog of the High Weald Light Railway (1977) Co. Ltd.
With some trepidation, I’ve upgraded the blog’s template to Blogger’s new ‘layouts’ format and hopefully everything is still working right. The main reason for doing this was the new ‘blog list’ feature which tracks all the other blogs I link to and saves having to go and look at each one to see who’s updated. I’ve added a few more links recently – including Chris Nevard who works in 4mm scale standard and narrow gauge with a focus on incredibly convincing scenery. I’m also trying out the poll function, please cast your vote on what scale(s) you model in the form on the right of the template. I’ll run new polls every month or so. Meanwhile, on the workbench, I’ve been making some test cranks for Blanche from plasticard to check the shapes I’ve drawn are correct. Once I’m happy with them, I’ll need to make a template 10 times larger than real life in order to mill a tool to injection mould the real cranks. You can see the original connecting rods are now too short for the accurate wheelbase of the Bullant unit, so these will be replaced with longer milled or etched rods. Hopefully I’ll be able to document this work with photos. 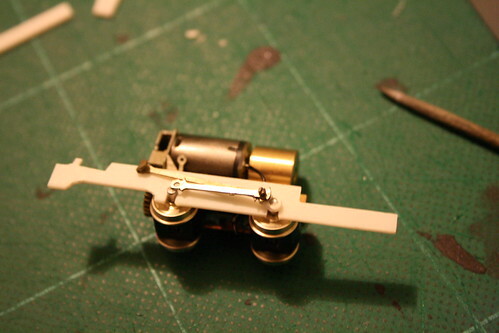 This entry was posted in 009, blanche, blogs, bullant, model railways, narrow gauge. Bookmark the permalink. Fairlight Works was first set up in 2006, when I returned to narrow gauge railway modelling after a break of several years, to document the construction of an OO9 (4mm:ft scale on 9mm gauge track) layout set at Fairlight around the Kent/Sussex border on the south coast of England. The concept was inspired by the High Weald Light Railway, which was the background to an O16.5 (7mm:ft scale on 16.5mm gauge track) layout called Hawkhurst, built in the 1990s by Dave Holman. For a time I owned one of Dave's later layouts - Cranbrook - another part of the same fictional railway, but found that 7mm scale didn't suit me as well as I'd hoped. Through various other diversions of scale and theme the idea of the HWLR always stayed with me. And so after a quiet period for personal modelling, while establishing Narrow Planet as a supplier of narrow gauge kits and etched items, I've decided to once again try my hand at building Fairlight in 009. Hopefully this time with more success.